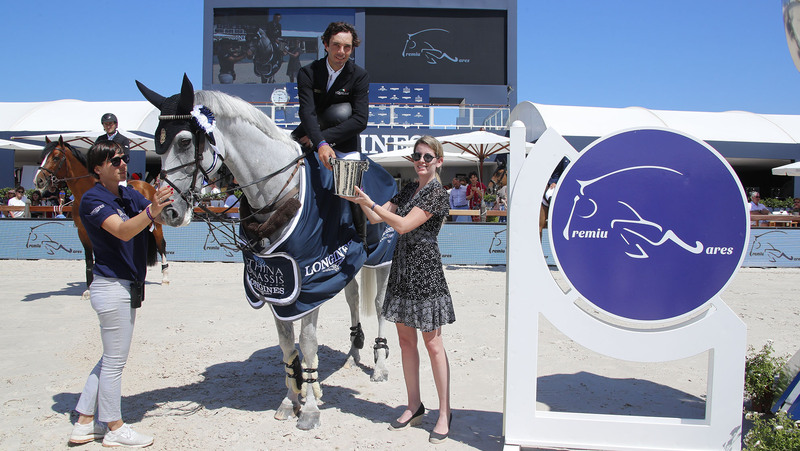 Eduardo Álvarez Aznar (ESP) opened the second day of the Longines Global Champions Tour of Saint Tropez, Ramatuelle, with a breath-taking win on his expressive grey gelding Fidux. As temperatures soared on the French Riviera, Aznar left the rest of the world class field in his wake, winning the CSI5* PremiuMares Prix speed class almost a full second ahead of the class. “After watching the other riders it was already very quick, but I had to try!” Aznar smiled before heading into the prize giving ceremony, where he was presented a trophy by Milena Pappas, Founder of PremiuMares. "He’s a fast horse and I really tried - I knew he could do the time, but I’m very happy with Fidux. It’s a fantastic venue [here in Saint Tropez] and a great way to start the day!" Uliano Vezzani put together a flowing course, offering up plenty of options for the riders to consider. The world’s best were given chances to turn inside the fences, or take the longer, arguably safer route around them. Plenty of riders gave it their best shot, but it was Piergiorgio Bucci (ITA) and the eye-catching liver chestnut stallion Casallo Z who quickly rocketed to the top of the of timesheets, the elastic horse reaching over the fences but turning on the spot in between. The Longines clock stopped at 54.57s, almost a second faster than previous attempts and setting a new time to beat. Others were forced into errors as they took on the course, with disappointment for Roger-Yves Bost (FRA) and Tesway de la Batia, Sameh El Dahan (EGY) with Championes and Julien Epaillard (FRA) with Usual Suspect d’Auge. Bucci’s time looked unbeatable, with the Italian the long-time leader of the fast-paced class. But quickly the tables turned. Bassem Hassan Mohammed (QAT) and Argelith Squid powered ahead of Bucci, the grey stallion just a touch quicker to finish in 54.24s. Temperatures rose higher still as French favourite Patrice Delaveau (FRA) entered the ring, the speed merchant a danger to the lead with his horse Vestale de Mazure HDC. The pair, famously fast for their blisteringly quick times pulled out all the stops, knocking half a second off the best time and propelling Delaveau to the top spot. Just one man stood in the way of Delaveau taking a home win, as Eduardo Álvarez Aznar (ESP) took centre stage with his flashy grey Fidux. The pair set off at a gallop, taking the tightest of turns, jumping the fences at an angle and shaving off milliseconds as they galloped to the final fence. With all eyes on the clock, the duo raced through the finish gates, stopping the clock just ahead in 53.20s and taking the win - almost a full second faster. The final class of the day, the Prix Julius Bär will take place at 16:35 local time - tune in via GC TV or on the official LGCT Facebook Page to watch the action with expert commentary and guest riders.